To this day, I still remember the evening that I was sitting in a dark theater, hanging on every word of the movie playing on the massive screen. My eyes had to have been huge as I watched the classic story of Elizabeth Bennet and Mr. Darcy unfold in the middle of the breathtaking English countryside. I had just turned thirteen, and that night was my introduction into a genre of story that I’ve grown to appreciate in more profound ways than I could have predicted then. Since that night, I’ve spent countless hours reading and watching stories we would call “period British dramas.” I’m now an avid devotee of everything Jane – Jane Austen and Jane Eyre. My friends also know me as the Downton Abbey girl. So, I recently began thinking about why I thrive so much on Pride and Prejudice, Downton Abbey, Jane Eyre, Sense and Sensibility, Emma, and so many more. What is it about these types of books, movies and TV shows that resonates with me so deeply? Aside from simple fascination with England’s rich, long-standing history and culture, I’ve identified a few things about this genre that hold value for me, as well as some things I think we can learn from them today. This is obviously a personality thing, but I have a deep appreciation for elegant things, and well-done period films and TV deliver that flawlessly. From the grandeur of a stunning estate, to the beauty of a fine evening gown, to the placement of a dinner plate, no detail is left unattended. And I’m fascinated to think that people actually used to live that way. There was an everyday appreciation for that kind of detailed elegance in dress, serving dinner, and running a huge estate. This is one thing that Downton Abbey exposes with excellence. I’m constantly in awe of the gowns and hair, and the house is breathtaking. It also shows how meticulous the staff of a large house had to be about their roles and not missing any detail of each task. On top of all that, period stories usually take place in the middle of the vast, scenic English countryside. 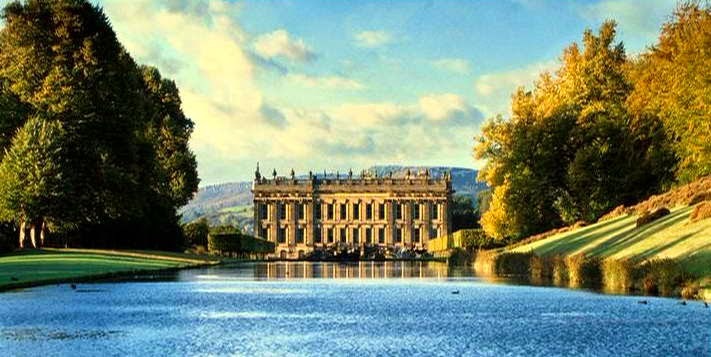 In Pride and Prejudice, Mr. Darcy’s splendid estate called Pemberley sits in lush Derbyshire in northern England. Downton Abbey looms imposingly over the countryside of Yorkshire. In Sense and Sensibility, the Dashwood girls relocate to a little cottage by the sea in peaceful Devonshire. And on and on… :) So, between the dresses, houses, and scenery, Downton or a film adaptation of an Austen or Brontë novel always proves an aesthetic feast, and I can’t ever get enough. Chatsworth House, used as Mr. Darcy's house, Pemberley, in Pride and Prejudice. Isn't it grand? The political and spiritual giant of the 18th and early 19th centuries, William Wilberforce, among many other things, set out to “make goodness fashionable,” as he put it. Great Britain was the world’s top superpower (sorry, America… we really haven’t been here that long), but was steeped in rank immorality, greed, and cruelty before Wilberforce and other such reformers came on the scene. Shortly after Wilberforce’s death, a new period known as the Victorian era was ushered in, and its impact continued after Queen Victoria’s death, until close to World War I. It was a golden age in Britain’s history, characterized by great affluence, harmony, and more refined sensibilities than a century earlier. In Downton Abbey, Mr. Carson, the family’s no-nonsense butler, frequently says that he likes for “things to be done properly.” Though I’m grateful that many of the strict societal expectations of period English tradition have worn off, I admit that I like the order and sophisticated manners I see in Downton and Jane Austen’s stories. The traditional gowns, formal dinners with the family, and late-night balls are very appealing to me. Especially balls… as a dancer at heart, I naturally dream of a society in which dancing is a part of everyday manners. 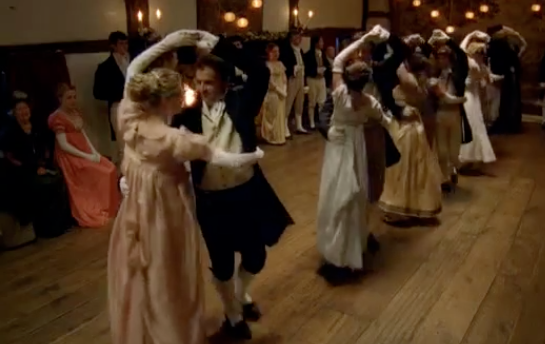 Mr. Darcy scoffs in Pride and Prejudice, “Every savage can dance.” I wish I had the luxury of saying so today! I also like the simple acts of chivalry that were so important then. Even things that might be weird now, like the men standing when a lady leaves the dinner table, or the man walking on the outside of the sidewalk, seem very courteous to me. Sophisticated language in period stories also catches my interest. Since I love words, and our technology-addicted society is getting progressively worse at good conversation, I look at how people used words back then with legitimate longing. Such class and sass are in so many speeches throughout period novels and films! In Charlotte Brontë’s Jane Eyre, when Jane and Rochester first meet, they go back and forth with witty, intelligent banter, lightly picking at each other the whole time, which I think is far preferable to the awkward small talk we have to put up with now! Also… letters. So many people don’t realize the value of a good letter these days. I honestly wish letters were still as important today as they used to be. The effort and time they take tells the receiver that he or she is important in ways that a text or facebook message never could. And you have a letter forever! I think that’s far better than the technological messages we often send as mere second thoughts today, so that’s something we could definitely learn from people back then. I probably couldn’t have articulated this when I was first captured by Pride and Prejudice at thirteen, but now, I better understand that period British dramas have an intricacy that many stories lack because of the added layers of societal rules, family expectations, and heavy cultural traditions. So, people in Britain a century or two ago had a few more aspects of life to consider when making important decisions. I find it very fascinating to watch or read about how people of different personalities would navigate their lives and choices within the limits of cultural propriety. And because there were so many customs to follow, the reader or viewer is forced to read between the lines and pay attention to certain expressions, gestures, and dialogue. From this, the audience often feels they know particular characters very well. This is certainly the case with all of Austen’s heroines, especially Elizabeth Bennet. Downton Abbey also masterfully engages the audience with each of its 20-25 main characters – I feel like I know them all and that no one is ever left out! As you watch or read about the characters in this close way throughout the story, they always are going through change and conflict, and by the end, they have learned important things and become better people. I like to feel like I’m learning alongside them, and to remember that people then were learning many of the same things we are today. But since they did it in the middle of harsh class divides and social expectations, I think their struggles seem harder and more admirable. In most period stories, some thrive on the order and traditions, but others are not above breaking them if the situation calls for it. People who watch Downton Abbey applaud Lady Sybil for sticking to her guns over marrying Tom Branson and think her high and mighty father should just let her make her own decision, but the uproar over it would have been real. We are so removed from that time period that it’s hard to imagine what the big deal is, but an earl’s daughter marrying a chauffeur would have been beyond scandalous and unheard of. But her navigation of that conflict strengthens her, and we certainly admire her more for it. So, even if you don’t enjoy these types of stories like I do, surely you can see why they’re worth appreciating. :) I know some people just don’t have the patience or attention span to let these kinds of plots unfold, but I think few can argue that they have depth and excellent character development. And since I love words, I hope you can see why they excite me so much! See what I mean about glorious gowns? 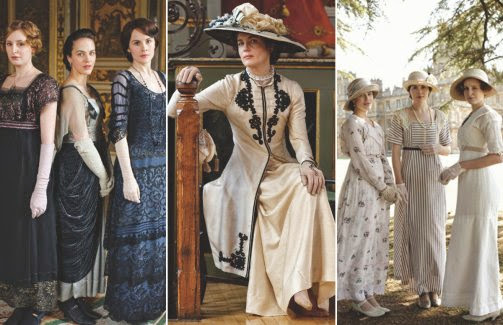 Downton does them magnificently!